In Wow 24/7. A crybaby Remainiac writes… This is a bit of a million dollar question. (Or in the case of Edinburgh economics, which are weighted against your average stand-up, a minus 47p question.) Can Brexit be funny? Seeing as many comics feel as if they have no choice but to talk about it (including me — I have been working on a show about Britishness and class for six months — how could I not, even if it has meant reworking the entire show? ), it’s not even a question. It had better be funny. Or else. 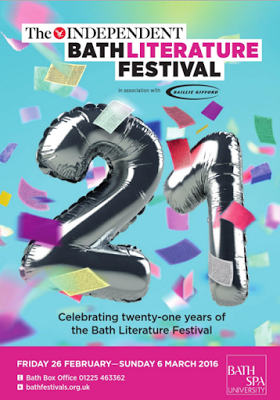 To help us celebrate our 21st we have a great cast: from Gloria Steinem (with Jenni Murray), Sebastian Faulks and Pub Landlord Al Murray in The Forum to Pat Barker, Joan Bakewell, Austentatious and The Shakespeare Gala (featuring Salon Collective and Extempore Theatre, the world’s only Elizabethan-language improvised play) in The Guildhall. Full programme (26 Feb to 6 Mar) here. Writing this piece for the Guardian on all the things I’ve inherited from my grandparents was cathartic but also difficult. I hoped it would help me to give away (throw away?) some of their stuff. But it just made things worse: it made me want to keep it all the more…. 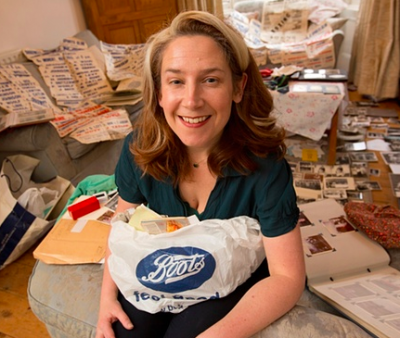 Still waiting for the phone call from Britain’s Biggest Hoarders. Some great advice in the comments and this issue sparks an interesting divide: half of the comments say “Get rid of it all — you will feel better”, the other half say “How could you ever let this treasure go?” I’m still torn. This was great fun to write. Highlights for me? Lionel Richie at Glastonbury (“When he was not reinventing himself as the “commodore of love” (“We [the Commodores] decided: we’re gonna make love to every girl in the world. That was our mission statement”), the 66-year-old Ritchie was celebrating selling 100m records.”), Suranne Jones in Dr Foster (“Was there anything on TV more deliciously entertaining and brilliantly captured than Jones as the GP Gemma Foster”) and Catastrophe (“Is there anything funnier than two hopeless but likeable people having a baby together? Apparently not.”). 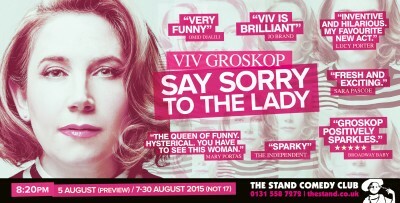 I will be performing the last not-in-London show of 2015’s Edinburgh show Say Sorry to the Lady at the Nottingham Comedy Festival at 6pm on Saturday 14 November on the top deck of this bus. I’ve done stand-up on the bus and I’ve been a guest on Irish comedian Christian Talbot’s addictive show Cheaper than Therapy on the bus. This time I will have the bus all to myself for a whole show. Well, hopefully, not quite all to myself. Tickets here. Review of the Edinburgh show here. 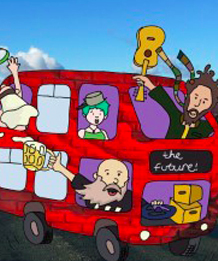 See you there, people of Nottingham who want to come to comedy on a bus! I have every faith this is an actual demographic. 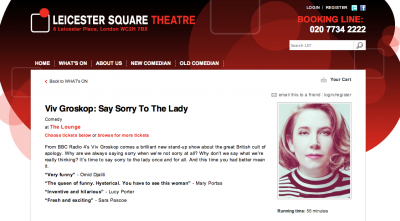 Say Sorry to the Lady pulled in a five star review, this from Funny Women (“cleverly structured and the kind of show that gets wilder and funnier towards the end of its run”) and played to full houses most nights, thanks to the excellence of The Stand. More on behind the scenes here, on the inspiration for the show and why sorry is not the hardest word in TV Bomb here and on why women should stop apologising in the Guardian here. By which I mean that women should stop apologising. And they should also stop apologising in the Guardian. Writing in today’s Sunday Times Style about the challenge facing over 1,000 performers this month: what on earth do you wear on stage if you’re doing the same show night after night for a month? Plus dashing between loads of other shows? It’s hardly a recipe for glamour. Thanks to Kyle Hilton for the illustration. Someone in the fashion department (who advised on the wardrobe choices above) obviously thinks I should dress like Velma from Scooby Doo. Hmm. Whatever happens, I will definitely wear something on my bottom half. 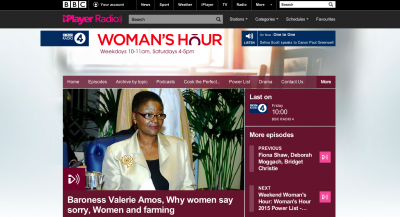 Talking about Say Sorry to the Lady on BBC R4 Woman’s Hour — and about why women seem to say sorry more than men, from 34 mins. Linguist Dr Louise Mullany, from the University of Nottingham, talking down the line appeared to disagree. She argued that men *do* say sorry as much as women but we don’t see them saying sorry as being something that is apologetic or pathetic. I’m not sure what this means. But I still think women should say sorry less. That is easier than the alternative, ie. arguing that when you say sorry it should not be interpreted as apologetic or pathetic. Good luck with that. In the green room it was good to meet the least apologetic woman in the universe: Baroness Valerie Amos, now director of SOAS, University of London. She is kickass. On Twitter, Jackie Watson sent me a very interesting rebuttal to this argument from Deborah Cameron — who argues that it’s basically sexist to examine how women speak at all — they should be allowed to say whatever they want (however doormat they sound) and they should not be expected to speak in the same way as men. I agree with the second bit. But men don’t own assertiveness and by being more assertive in the way you express yourself, it doesn’t mean you have to talk like a man. I don’t really agree with the rest of it – here – but all the same, it’s fascinating. By the way, if you are going to talk like a man, please talk like BRIAN BLESSED. I AM TALKING LIKE HIM RIGHT NOW. 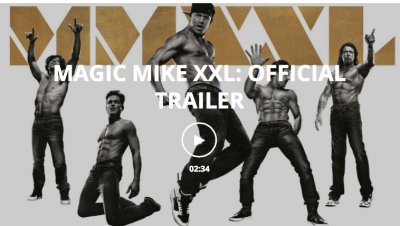 I wrote this piece about Magic Mike XXL, the sequel to the 2012 smash hit Magic Mike, which cost $7 million to make and took over $150 million at the box office. And made a huge star of Channing Tatum. The sequel has great cameos from Jada Pinkett Smith and Andie Macdowell and is surely one of the funniest films I have ever seen, right up there with Spinal Tap. I know this seems unlikely when it is about stripping but it is true.